Relocation or shifting is undeniably an exhausting, tedious and time consuming task. Not only that, but also it is associated with lots of memories of the place you decide to leave. While you move to another city such as Chennai, you can be sure of adding some of the memories to the chapter of your life. Apart from that, you are soon going to be a part of totally a new place. Hence, comes the emotional factor when we talk of shifting. Here is how welcoming Chennai can be for you!!! A city which has been witnessing development at a faster pace and is turning out to be the favorite destination of the people moving in, is surely the ‘Gateway of South’, it is Chennai. Owing to the fast paced development and opening of many new educational institutes, there has been an increased movement to this city during this phase. Be it for a job or for education, be it for personal reasons or any other reason, people when move to CHENNAI, might need some easy yet effective tips which could help them in an effortless relocation. Chennai is the capital city of the Indian state of Tamil Nadu, which is surrounded by the beautiful beaches. It is a flat coastal plain, with two rivers flowing in the city. The city has tropical wet and dry climate and hence one can consider carrying the required items, depending on his or her suitability while visiting the city or planning to relocate to the city. It is advisable to check the weather and the prevalent climatic conditions of the capital city, Chennai, during the specific months when you plan to move. Accordingly, do not forget to check your bags for things like shades, umbrella, raincoats, woolens etc. There is no denying the fact that considerable amount of research is required when you think of relocating. 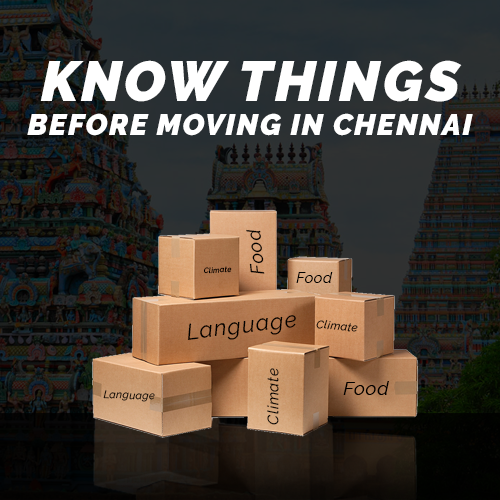 However, we have gathered some of the useful points which need to be kept in mind while you plan to move to Chennai. You need to research and plan things well in time, as it will be a new city! Well, this is one of the most important points which need to be considered while you are moving. Planning that too with proper execution is required while you plan to move to any city of India, or may be the world. You need to plan everything and gather ever bit of required things, so that you do not face any challenges while you move to the city. When it is about Chennai, you need to find about the budget hotels and restaurant near your locality which serve everything you want to have in your meals, as all of us can’t rely on idli and dosa that you when you know you are not on a vacation and that is going to be your new residence. Well, yes a good house shifting service in Chennai could surely make your task a bit easier. You can get the desired help while you move. Along with that, you can take care of your family more easily, while they take of packaging, loading, transportation, unloading and unpacking of your goods. Finding professionals is your new headache? Do not worry, here you have the solution! Nonetheless, when you expect these services to be the best-in-class, along with being from the verified service providers, then you can consider LogisticMart. This platform has helped hundreds of customers find the right solution, when it comes to logistics industry. They simply provide you at least three to four quotes from the mover and packers as per your need, this makes your task easier and you simply choose the most affordable and suitable options. Also, since every business registered with LogisticMart is authentic and reliable, hence it is advisable to choose such a platform. These platforms help you end up with the sound decision that too in minimum time. While you choose a movers and packers in Chennai, make sure that you have either connected with them via a credible platform, or have done enough research and review at your end. You can even refer to the information provided on the official websites of the service providers. And when you consider the business providers from the quotes offered at LogisticMart, you can be sure of making a sound decision in a go, as every business registered with us is authentic, credible, and reliable. Be it researching about your wife’s job location, or about your kid’s school, you need to research about the same. While you move, your family should not suffer, they should remain grounded. Especially your kids, they get attached to the place they have been living until now, however when you move, they find it difficult to take the memories along and leave the people and the place behind. Hence, you need to take care of their convenience at the new location and make them feel comfortable. Do not piss off people by telling them that Hindi is our national language, and that is the best way when you want Chennai to be more welcoming for you. You can better read about some of the most-used words and slangs of Tamil. And there you go…all set to move to Chennai. Wish you a happy and safe moving; remember a new city and people with really big heart are surely going to welcome you.